Would you hire Saint Patrick? – Science Calling! With original artwork by EP for Science Calling. If Saint Patrick was applying for a job today, the hobbies and interests section of his CV would be enough to see him through any interview. Changing careers from shepherd to saint with a gap year spent interning as a slave for pirates. He developed a burning love of the shamrock and a passionate dislike for snakes. Driven to the extremes of love and hate on these two topics, revelations that the shamrock is no longer a plant and that creatures he might consider snakes live and breed in Ireland might lead to mixed emotions. A truly depressing article in yesterdays Irish Times by wonderful science writer and broadcaster, Mary Mulvihill, laid out the facts in black and white. I’m sure St Patrick wanted to buy all the copies and hide them under his bed, but Mulvihill reminded Ireland of the truth, the shamrock is a sham! In fact the plant-wannabe didn’t even bother to conceal its deception as Mulvilhill writes “the word “shamrock” simply means “young clover” (seamair óg)”. The article continues to explain how this fraud has been exposed by an experiment in the 1890s and again in 1988. These revealed “five very different species of plant, which were being used around the country as shamrock”. Siding with our Patron Saint, we Irish have obviously decided to turn a blind eye to this scandal. Read how the shamrock suddenly disappears in the summer and the rest of this brilliant article by clicking here. 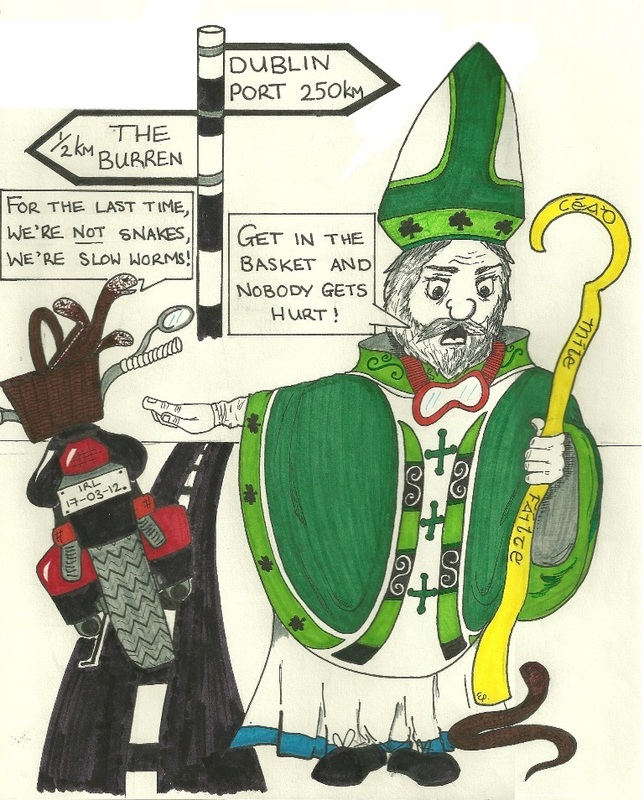 If having a tarnished symbol as your legacy wasn’t bad enough, St Patrick’s references aren’t looking good in regard to his other passion, banishing snakes. Snakes are being kept as pets in many households across Ireland and a suspicious looking creature has taken residence in Co. Clare. On a positive note, the ISPCA seem be siding somewhat with the saint (though they’re not adopting his extreme “banish them all” motto just yet). This morning, when I spoke to Carmel Murray, ISPCA Public Relations Officer, she said “Currently in the Republic of Ireland, there is no legislation directly licensing the keeping, buying or selling of any exotic animal within the pet trade. There is an unknown number of venomous snakes in Ireland and if bitten, it could be fatal. The ISPCA would like to raise awareness for the need of legislation directly licensing the keeping, buying or selling of any exotic animals within the pet trade in Ireland”. To encourage responsible ownership, the ISPCA issued a St. Patrick’s Day press release this morning. If you’re thinking about buying a snake or already own one, check these tips out as you could end up with a 9 metre-long reticulated python if you’re not careful! Returning to our patron’s woes, a creature usually present in the UK and mainland Europe has recently become an inhabitant of the Burren. They look like snakes, they move like snakes and St Patrick, being a busy man, would probably banish them along with their “evil” cousins. Before his legacy completely crumbles, it is advisable to look more closely. They blink (snakes have no eyelids), have visible ears (again not present on snakes) and if they mistake you for a predator they’ll slither away without their tail (snakes like to keep their tails). These are the slow worm, a legless lizard found on the reclaimed meadow fringes of the Burren. According to TG4’s Alien Invaders series, legend has it that they were brought over to Ireland by British hippies in the early 1970s. Ignoring the fact that Ireland had no snakes to banish back in the 5th Century, St Patrick’s reputation is still somewhat intact. His people have chosen to overlook the tiny fact that the shamrock isn’t a plant and instead export yellow clover to Irish descendants all over the globe. There are still no snakes living and breeding in the wild in Ireland. To top off this first-class CV, he is responsible for the world celebrating all things Irish for an entire day each year. You’d be a tough employer not to be impressed with that! Great post Maria – nice way to start off the long weekend! Who did the drawings? They’re awesome! My cousin-in-law did them especially for the occasion. She’s amazing and likes to be known artistically-speaking as EP.